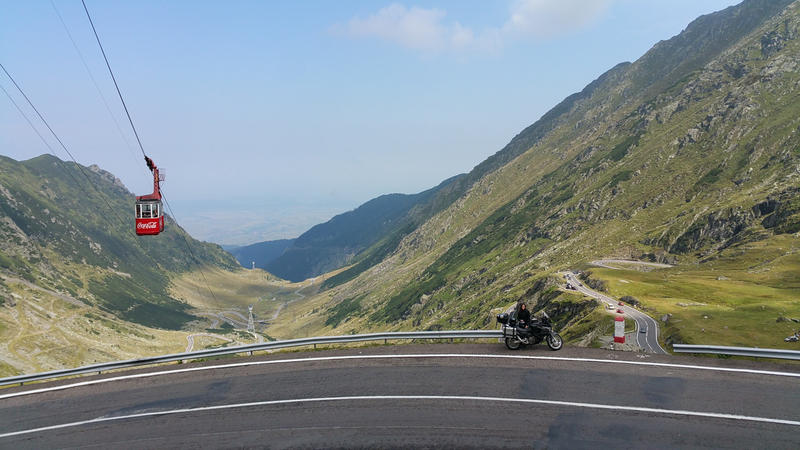 The destination is Romania, in particular some mountain roads that Top Gear has placed in first place of its sport-driving ranking, overtaking even the Italian Stelvio Pass. We are travelling with our Varadero, taking our world with us, safe in a complete set of Trekker cases. We are certainly not going there to race, but rather to feel like travellers. 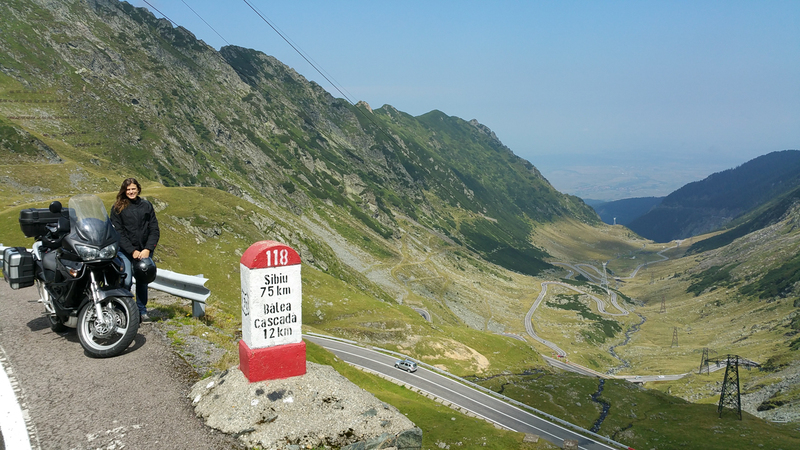 The destination is Romania, in particular some mountain roads that Top Gear has placed in first place of its sport-driving ranking, overtaking even the Italian Stelvio Pass. We are travelling with our Varadero, taking our world with us, safe in a complete set of Trekker cases. 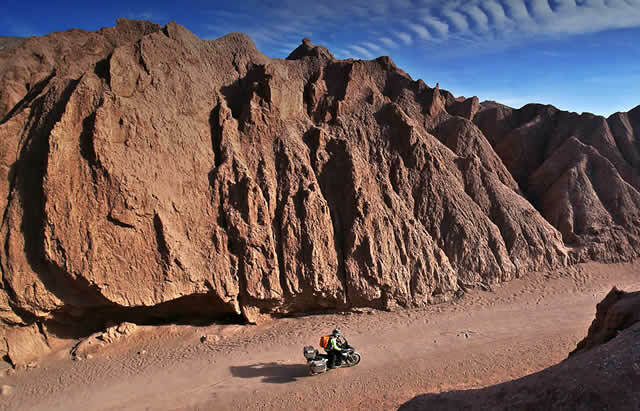 We are certainly not going there to race, but rather to feel like travellers. To this end, going east offers a tangible feeling of change immediately after Slovenia, because languages, traditions and currencies keep changing, and this constant adaptation to new scenarios makes us forget the classic image of the beached and relaxed tourist and feel more like travellers. The motorcycle, more than other means of transport, helps you to mix with the population of a new village, thanks to a child’s curiosity, or the help of a passer-by giving directions. In the morning we have breakfast with ice-cream (the night before we already had problems finding food seen that bars serve only drinks) and we get back on the motorway to Belgrade. We cross the busy frontier of Batrovci which we reach through an almost empty motorway which transforms into a queue close to the border. We understand why in these areas people estimate taking at least one hour to cross the border and we realise once more that the East is changing things: there is a type of Europe we know and one, a lot bigger, that is very different and that we cannot generalise because Schengen and the freedom we are used to quickly disappear. 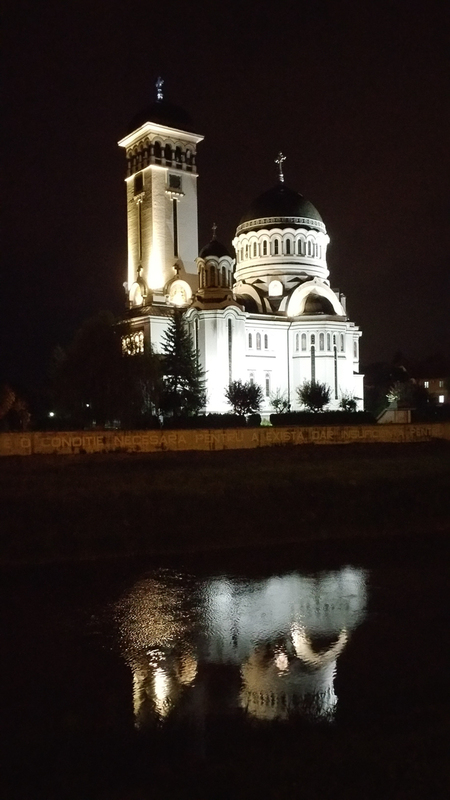 Once in Serbia in just over 100kms we are in the centre of Belgrade. We sit on the defence wall of the Kalemegdan fortress and look North-West at the Sava flowing in the Danube. That will be the new direction to follow. 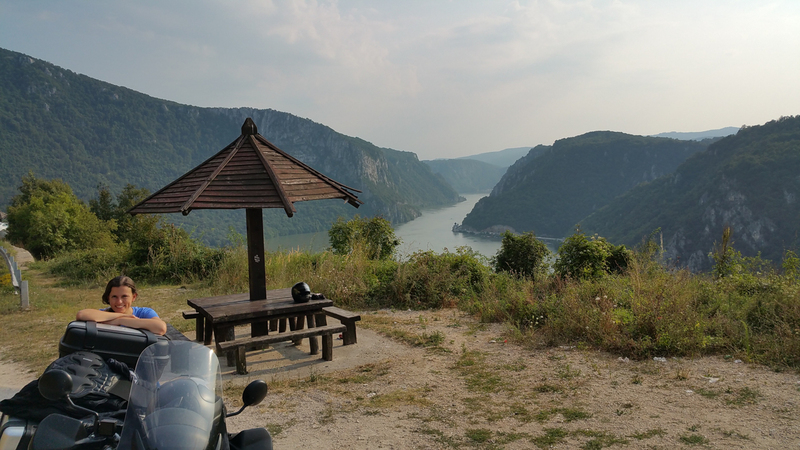 The great European river offers views of natural surroundings, villages, beaches, beach-volley courts and, finally, a nice road to ride on a bike. 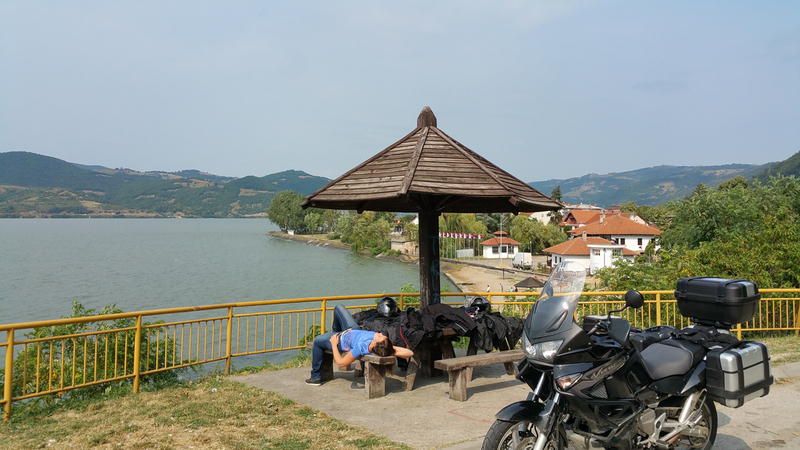 The tarmac is good, traffic inexistent and up to the bridge on the Danube near the Romanian border with Drobeta Tumu Severin, we ride happily, leaving Serbia behind, smiling in a sunny summer afternoon by the banks of this immense river. It’s round 5 pm but we choose to cross the border to look for a place to sleep. I would define the impact with the new country as disconcerting, security checks are absurd, we see police rummaging in car trunks, checking suitcases, randomly opening some of them . When it’s our turn, besides checking documents, they register the bike and ask us why we are there and which route we plan to do. We say goodbye to the Danube and releasing the clutch I exit the customs area. A signpost at the entrance of the city indicates road 67 that goes north to Targu-Jiu and, while observing some goats freely grazing along the road, we convince ourselves that, regardless of the hour, it is best to do some more kilometres. 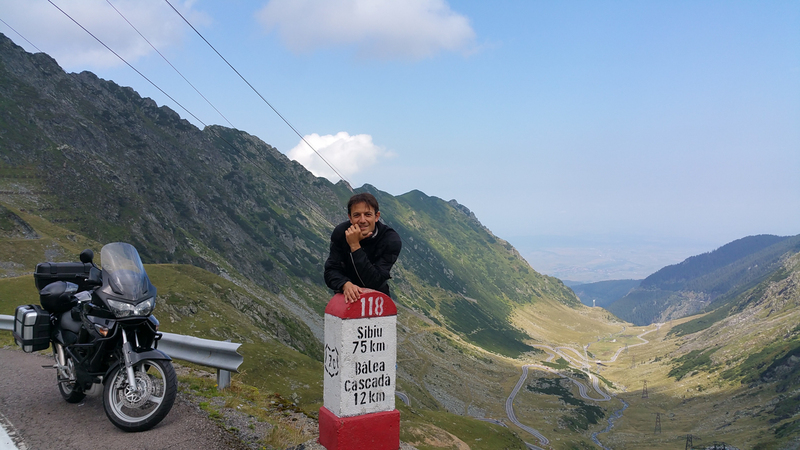 The 80 kilometres that connect the two Romanian cities are the most peculiar and unexpected of the trip. We enter Romania and we see only underdeveloped rural villages, sewers next to the roads, animals and many stray dogs roaming everywhere. At the beginning, as when we were in the Albanian interior, we discuss poverty, pointing out the man with the pitchfork, the woman with the cow, the bare-foot child, the free goats on the streets. Then, at a second time, poverty makes us think, and I proceed in silence, at thirty kilometres an hour, among the looks that stare at me as if I were a spaceship. The sun is setting and during the last hour of light I do the last kilometres to reach Targu-Jiu, people from rural villages become city-dwellers and the suburbs first, the lights of the centre later, mix poverty with movement and traffic of Dacias. 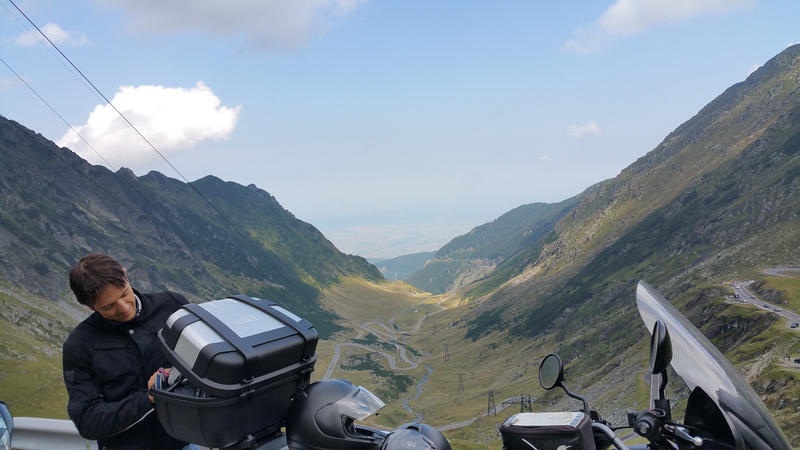 We have reached the foot of the Carpathians and the Transalpina first, the Trasfagarasan cradle us at an altitude of over 2000 metres while crossing these mountains. Between the two passes (don’t think it’s like in Canazei between Sella and Pordoi, here there are over 100kms of plains) we stop at Sibiu and confirm the advice received from friends and Lonely Planet. 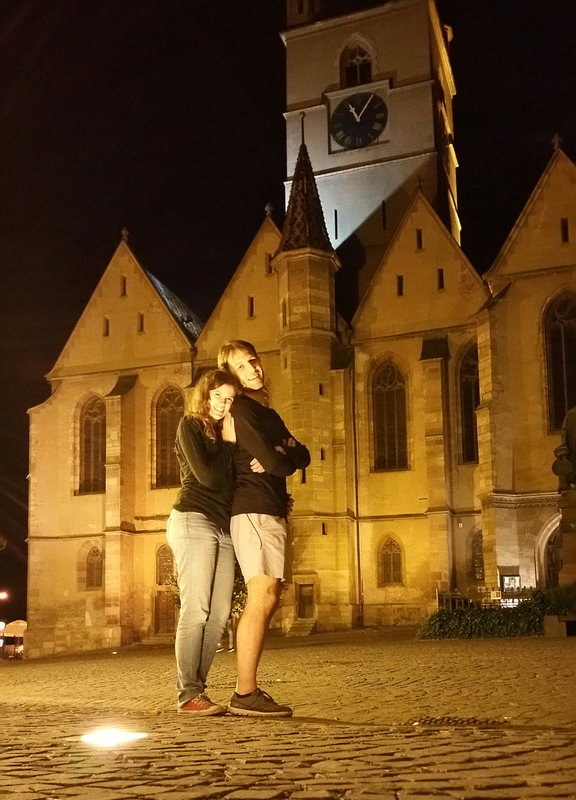 The city centre is nice and even if it’s dark we find a way to take a nice picture as a memento. The Trasfagarans seemed overrated to us, a bit like Top Gear did calling it The Best Road in the World: we found a mass of tourists taking pictures of the scenery, a waterfall, a cloud, a hairpin bend and the place lost a bit of its magic. Surely, besides the aesthetic parameter according to which it was ranked, as travellers we consider also the wider context. What makes this area special are the legends and superstitions about the figure of Vlad the impaler which have been told over the centuries. That is why, coming down from the Trasfagarasan we quickly cross Curtea de Arges and continue to go up towards Brasov, in Transylvania . 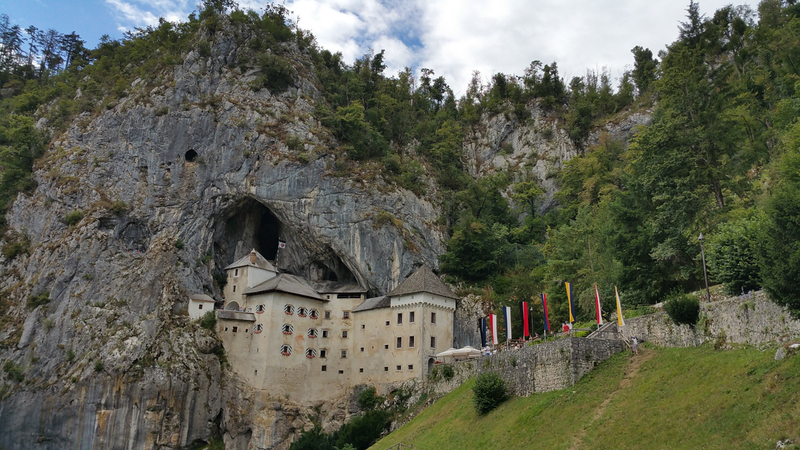 What better stop than Bran, the tourist resort developed around Dracula’s castle. We go out at night to take pictures of the lighted castle, thinking about the many stories it has generated and how it has influenced literature. The following morning we move north-west along a nice main road that connects Brasov with Sighisoara. 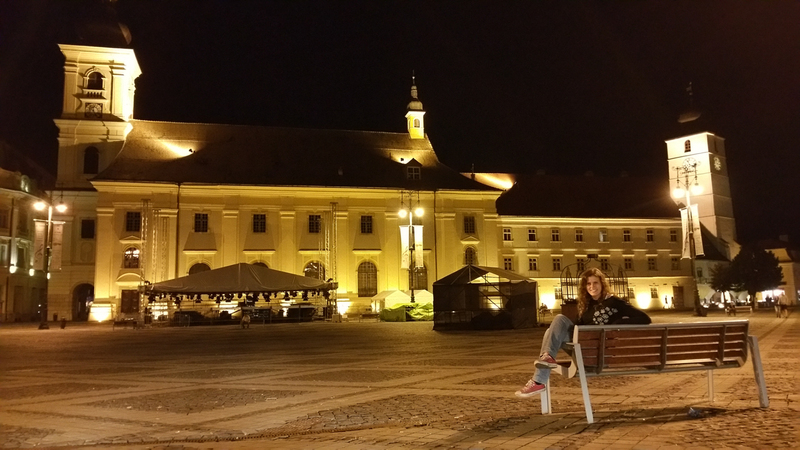 As for Sibiu, we are astonished by its beauty and we feel like recommending and including it in a Romanian tour. You can feel the Saxon influence here, in its name and the city’s architecture and fortifications. 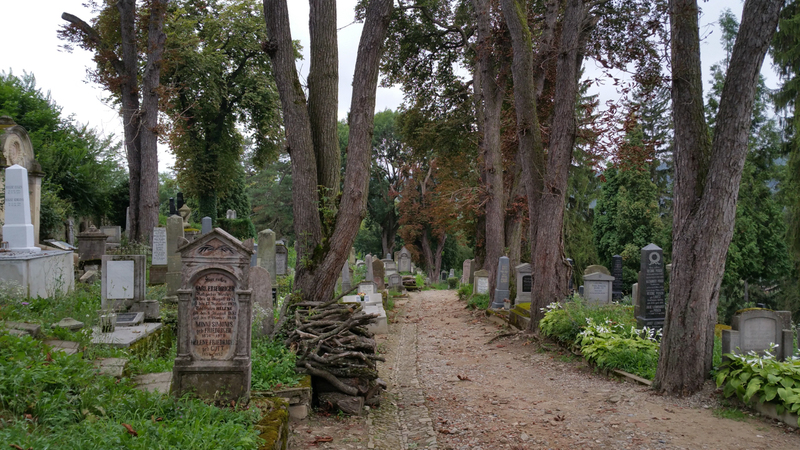 It’s a gloomy day and while walking in the narrow Medieval streets of Sighisoara, we feel we are in the land of vampires, from the city’s highest point we look down to the church and cemetery (Biserica din Deal) and we understand how Dracula’s story was born here. 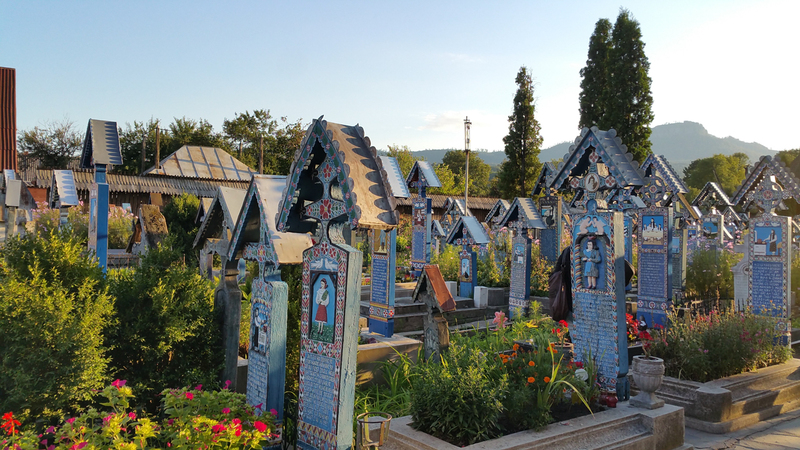 We move on towards the heart of Romania, the Carpathians’ range is well behind us and there are only green hills that take us on a nice main road to Targu Mures first and then Cluj Napoca. Following back roads (1J) after Gilau we get on the 1F: a very pleasant road, good bends and excellent tarmac that crosses the northern forests of Transylvania up to Zalau. This city is not exactly a ‘must’ but climbing a few kilometres up a hill to the east you can find Porolissum. 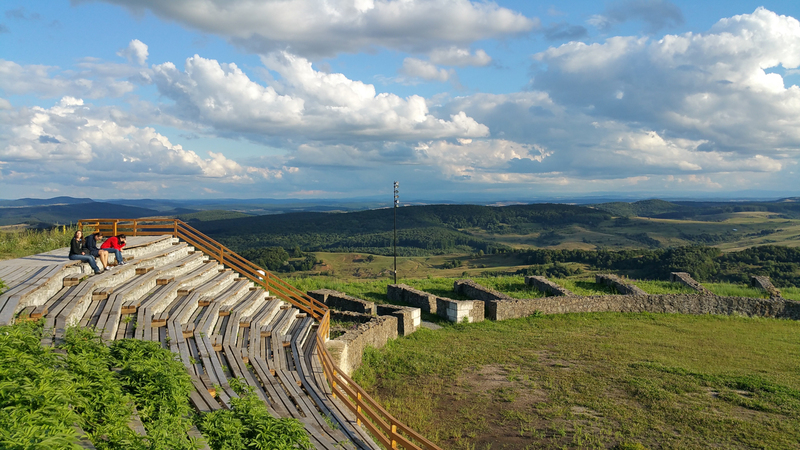 This place is certainly worth a visit as Roman ruins are set in beautiful natural surroundings and the view is 360°… No wonder this was the last Roman outpost of the area, with a road that connected to Rome and the rest of the Empire. Looking north-east, I can see where immense Russia begins and I feel the irresistible urge to discover, to do thousands of kilometres in the steppe until I reach Siberia. 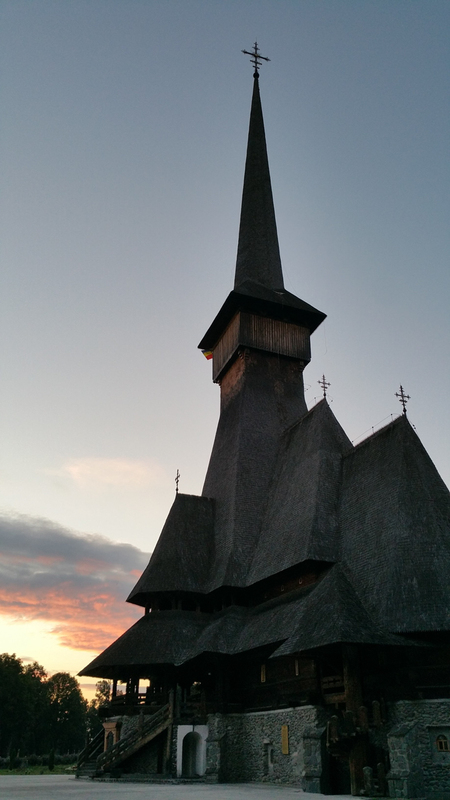 Back to reality, the following morning we leave towards the most northern region of the country: Maramures. 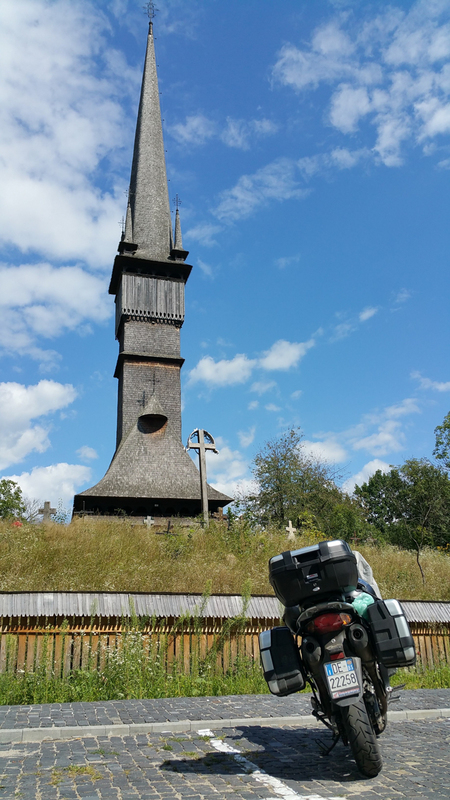 This region, definitely less known than the others, famous for its traditional wood churches, has a surprise for us. 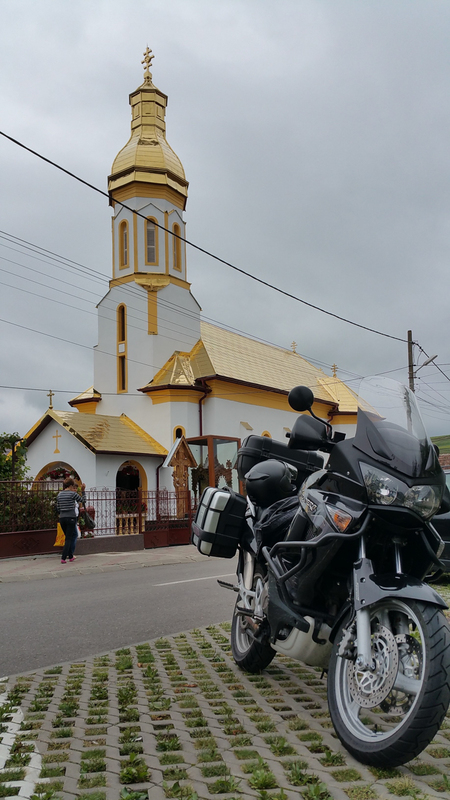 It is a very pleasant ride along these roads that keep moving up and down, we cross Jibou first, then Baia Mare and among the many churches we go down the Mara valley to Sighetu Marmatei, the North border crossing to Ukraine. On the Tibisco river our outward journey ends and in this border town I realise that, given the time I have and the beauty of the lands I’ve crossed, this is not the end of the motorbike journey in Romania, but the point where you reach the top and decide to go forwards, not down a hill though, but towards East Europe. 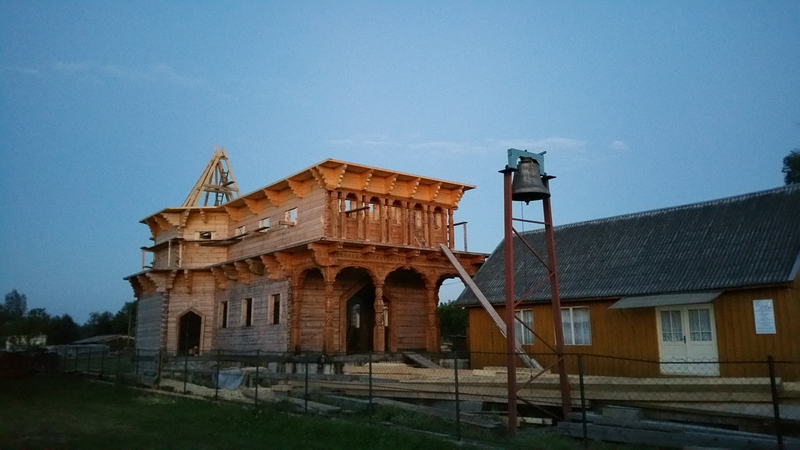 We follow the river west, Ukraine is in front of us but we go south, until we reach the nice village of Sapanta, famous for its painted cemetery and for a nice modern wooden church which is 75 metres high. 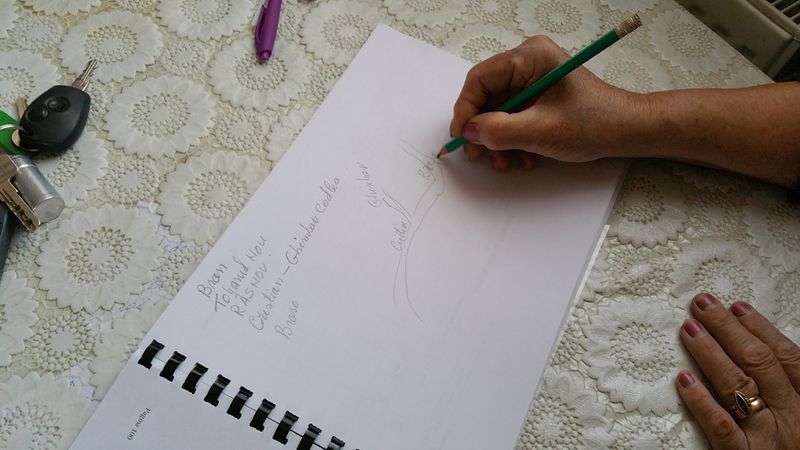 We leave the village and go towards Satu Mare, from which we then enter Hungary at the Petea border crossing. Hungary is immense and flat, we could see that from the map but now we are here, entering from North-East we see it first hand. After Mateszalka we find the motorway and kilometre after kilometre I could tell you about forests and Alpine roads… But this is already our Europe. 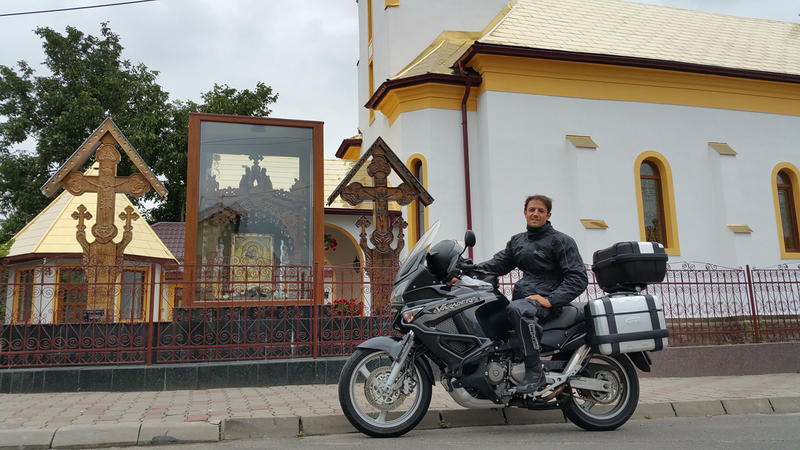 Claudio Franchi, born in Brescia (Italy) some thirty years ago and brought up with the love of his family that made him also a passionate biker… And with him, the bikes have grown: Varadero 125, V-Strom 650 and Varadero 1000. 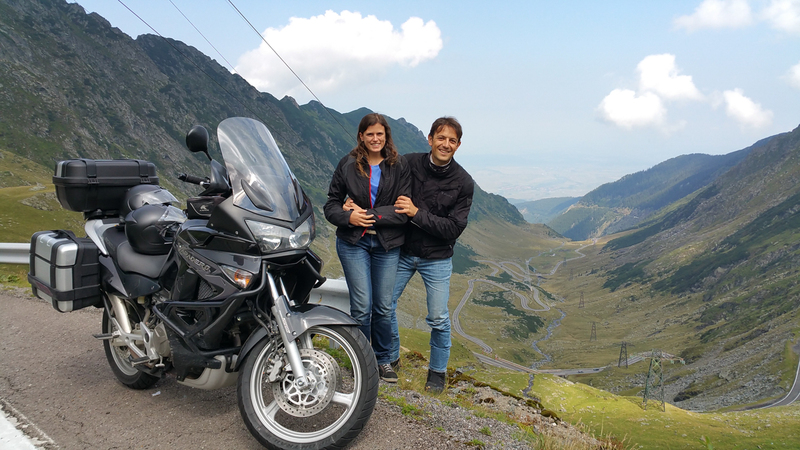 He lives in Bergamo (Italy) with his girlfriend Stefania, owner of a Ducati Monster and with whom he shares his passion for motorcycles and bike trips, during which she accompanies him as his trusted passenger. The set of three GIVI Trekker cases went with us on this trip with its 52-litre top case, that combined with the side cases allowed us to carry a great load avoiding the ‘vagabond’ look you see on many bikes with bags and nets tied all over the place. Besides the cases, two other things completed as well as made a difference for the trip: the front screen that, being 9cm higher than the original one, offers excellent protection against wind and the internal bags for the side cases. Having to sleep each night in a different hotel, it is fantastic to be able to simply remove the inside bag from the case and go to your room just with that.